Breezeway Iris Garden is a family-owned business in Madison, WI. 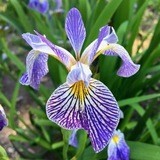 We sell all classifications of Bearded Iris. Each year we acquire and plant hundreds of new varieties from award-winning hybridizers. We carry the full line of Jack Worel introductions. Look at what is new for 2019! Ordering Season for 2019 is May 1-July 15! From hybridizer Jack Worel. White with all over blue-violet veining on small standards and later veined blue violet style arms above white ground rounded falls. Named for Jack Worel's wife Jan, this new offering delights with pinks and contrasting blue/violet beards. Gently ruffled standards are darker at midrib with a slight blue infusion when opening above lighter pink falls. From hybridizer Jack Worel. Gently ruffled light peach-pink standards are slightly darker at midrib above lighter peach-pink falls darkening at hafts and edge. 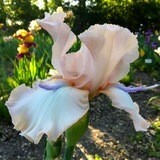 Delightful pink with violet tipped beard new introduction from hybridizer Jack Worel. Lightly ruffled medium bright pink standards are lighter towards edge above medium bright pink falls with slight tangerine infusion on shoulders and bright tangerine beards.